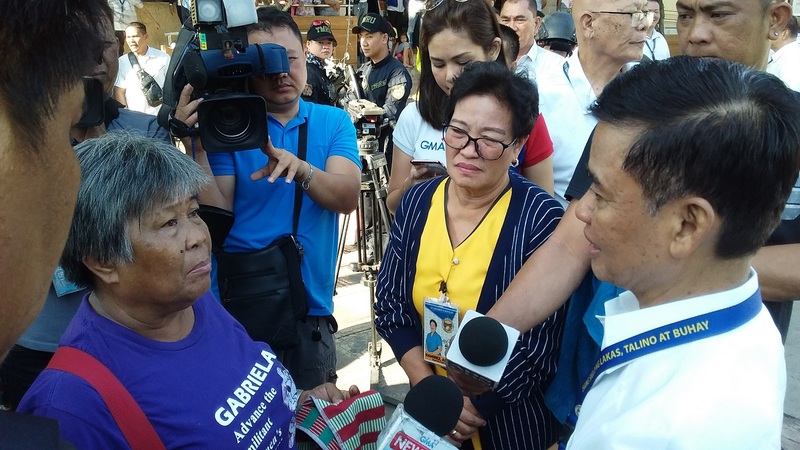 Muntinlupa Mayor Jaime Fresnedi (right) meets Kadamay Munti president Bella Diaz (left) during a protest rally staged by National Bilibid Prison (NBP) Reservation residents at Muntinlupa City Hall, Putatan on March 25. Kadamay Munti and other militant groups trooped in front of the City Hall to call for action against the NBP Master Development Plan and demolition of settlers. Fresnedi told the group that the National Government has jurisdiction over NBP. However, the local exec said the City Government and the Office of Congressman Ruffy Biazon will coordinate their concerns to authorities.